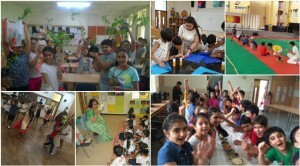 The 28th Founders Day was celebrated in school on the 18th of July and the school wore a festive look. It started with an assembly where our children of class 5 set the tone for the day with a display of different dance forms followed by the felicitation for the long service awards and special awards. The day was filled with activities ranging from ‘Story Telling’ by grandparents for elementary children, to choice of activities for junior school. They also honed their culinary skills with a variety of delicious mouth watering dishes across school. The children also witnessed a short presentation on the journey of school and the takeaway ‘a sapling’ was one that would keep the memory of the day alive for years to come.